Many investors were rattled by the stock market correction earlier this year. And predictions that more significant adjustments could be on the way have further stoked clients’ fears. When clients open their investment statement only to learn that their portfolio has lost value, it can trigger a feeling of uncertainty that may lead to impulsive, emotional decision-making. To keep investors on course, financial advisors need to ensure that their clients have the information they need to consider current volatility in the context of historic returns and their long-term goals. In the first quarter of 2018, U.S. investors experienced 11 days with losses of greater than 1 percent on the S&P 500. Contrast that with last year, when the S&amp;P had a total of only four days that closed with such significant losses. Fortunately, most of these shifts were relatively short-lived and had little impact on the average investor’s portfolio. Despite all the concern, the S&amp;P lost less than 1 percent of its total value in the first quarter of 2018. Those who have been investing for a decade or more clearly remember the 2008 recession, but how many remember Black Monday — Aug. 8, 2011 — when investors lost approximately $1 trillion in a single day? On that day, the Dow Jones Industrial Average lost 634.76 points (-5.55 percent) to close at 10,809.85, making it the sixth-largest drop of the index in history. Beginning in 2015 and extending into early 2016, markets experienced two more significant corrections that shook investors’ confidence. On Aug. 24, 2015, the Dow dropped nearly 1,100 points shortly after the opening bell, and then January 2016 saw 93 percent of investors lose money as the Dow lost 5.5 percent of its value. Most have already forgotten those downturns because their portfolios have since recovered. Clients need to know that market fluctuations are common and, with proper planning and asset allocation, no reason to panic. Strategic, long-term financial planning should begin on day one, not after a correction has occurred. Since market shifts are normal and inevitable, preparing for them must be incorporated into every client’s investment strategy. Consider a client’s age, risk tolerance and temperament when developing their investment plan. A realistic plan that a client can stick to is infinitely better than a perfect plan that the client abandons. When clients have a predefined, disciplined process, they are much more likely to stay the course and avoid making shortsighted moves that they may later regret. Clients rely on their advisors to be a voice of reason and offer guidance that reflects their stage and goals. Market volatility can actually be a positive for investors who are still in their wealth-building stage. Buying equities when prices are low can help younger clients acquire bargains that will grow in value over the long term. 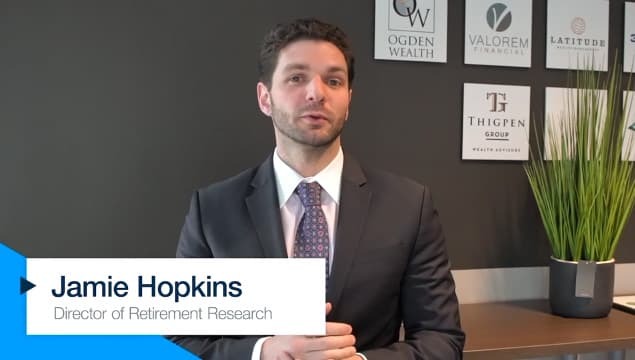 Investors who are a few decades away from retirement need to know that short-term losses won’t have much impact on the value of their portfolio over time. Although diversification is important for all investors, age-appropriate asset allocation becomes more critical for clients who are approaching — or already in — retirement. Older clients with shorter time horizons should take steps in their portfolios to mitigate severe drawdowns. This can mean investing in a more conservative asset allocation as well as using a more tactical strategy with a disciplined process. Baby boomers and seniors who are relying on their portfolios for income can be better prepared for downturns by holding a portion of their portfolios in low-risk assets like cash, certificates of deposit or bonds to avoid needing to sell stocks when values are low — in essence, reducing sequence-of-return risk that is inherent in the distribution phase. As humans, our choices are never made in a vacuum. A variety of cognitive biases can influence an investor’s decision-making, particularly during stressful times. Educating clients about these biases can help them take a more objective, strategic approach to their investments. Loss aversion and the sunk costs fallacy are often observed in investing behavior. Psychologists Daniel Kahneman and Amos Tversky have found that humans are more fearful of potential losses than they are enthusiastic about potential gains. In their attempt to avoid losing more value, some investors may look to cash out equities when markets are shaky. Meanwhile, other clients may opt to stay the course with stocks or funds that are underperforming because they feel that they have already invested too much to walk away. Financial advisors and their clients also need to be aware of recency bias, the tendency for the recent past to have an outsized influence on investors’ behaviors. Instead of considering historic performance or emerging trends, investors may extrapolate current conditions as indicative of future returns, which can lead to faulty assumptions. Encourage clients to consider an investment’s longer-term performance and fit within their overall strategy before making a decision. Whether the news is good or bad, clients appreciate ongoing communication and guidance from their financial advisors. Reaching out to clients with details on their portfolio’s performance helps bolster their confidence and demonstrates that their investments are in good hands. When financial advisors work proactively to manage their clients’ expectations and establish a realistic investment plan, clients are able to better weather inevitable market volatility. Eric Gritter, CFA, is vice president of investment strategy at USA Financial. Eric may be contacted at eric.gritter@innfeedback.com. Is Your Client List More Like A New BMW Or An Old Pontiac?